Dr. David Friedman explains it all. 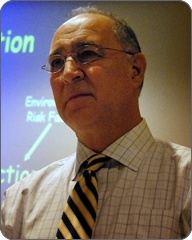 Dr. David Friedman, a professor of physiology and pharmacology at Wake Forest University School of Medicine, is also the co-founder and director of the Addiction Studies Program, a workshop for science journalists in Washington, D. C., funded by the National Institute on Drug Abuse (NIDA). 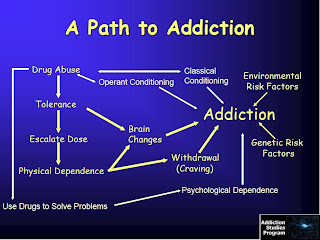 Sometimes it helps to step back and attempt to make the scientific case for addictive disorders as simply as we are able. 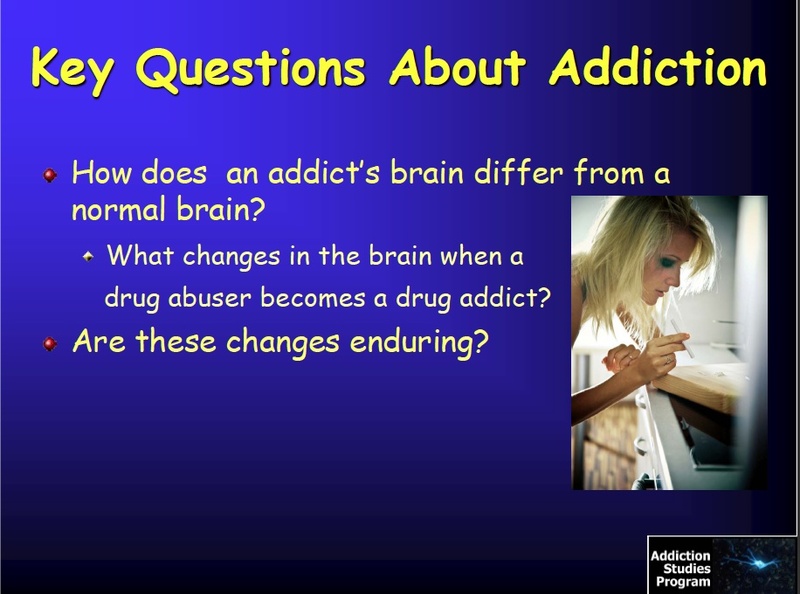 Herewith, some highlights from Dr. Friedman’s useful presentation at the recent Addiction Studies Program workshop. Slides reproduced with Dr. Friedman’s kind permission. The comments adjacent to the slides are my own, as are any errors of fact or interpretation. As a chronic medical condition, or “brain disorder,” addiction has a fair amount in common with other diseases, like hypertension, asthmas and diabetes, Friedman said. Relapses and setbacks are frequent, but not found in every case. 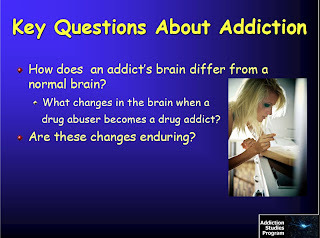 The key questions, indeed: What is different about the brains or the genes or the nerve cells of those who become dangerously addicted, compared to those who can take it or leave it? Scientists have discovered various so-called “markers” over the years in the brains of the children of adult alcoholics, but none of these have been broad enough in scope to point toward anything like an effective near-term treatment. However, the recent shift from chasing genes to studying neurobiological brain processes is a hopeful turn of events. 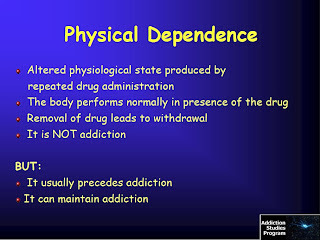 Again, a crucial distinction must be made between a state of physical dependence (at right) and a state of withdrawal (below). 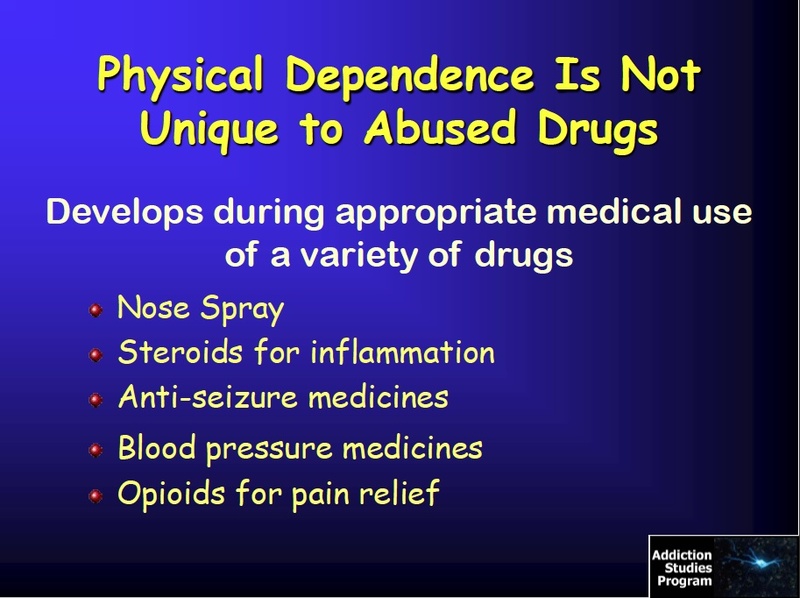 Non-addicts can become physical dependent on a variety of prescription medications. 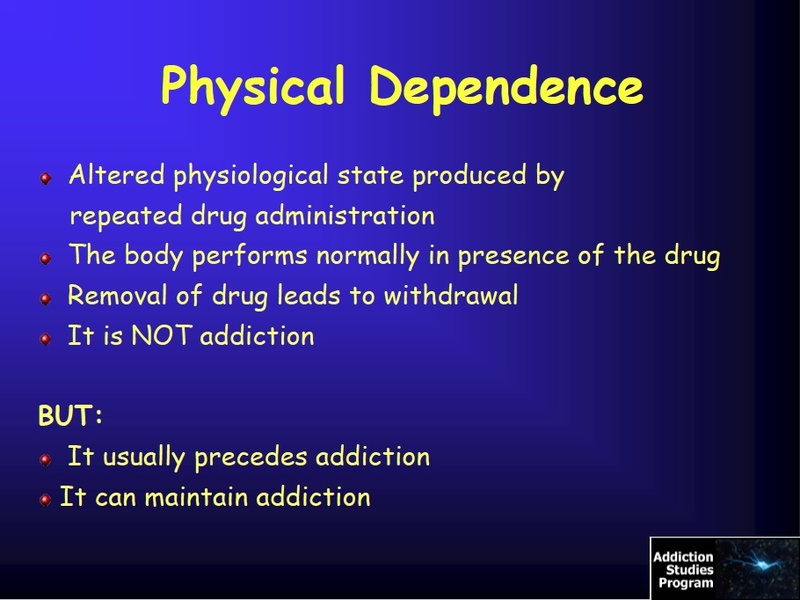 Such physical dependence precedes a full-blown state of addiction, but is not to be confused with addiction itself. 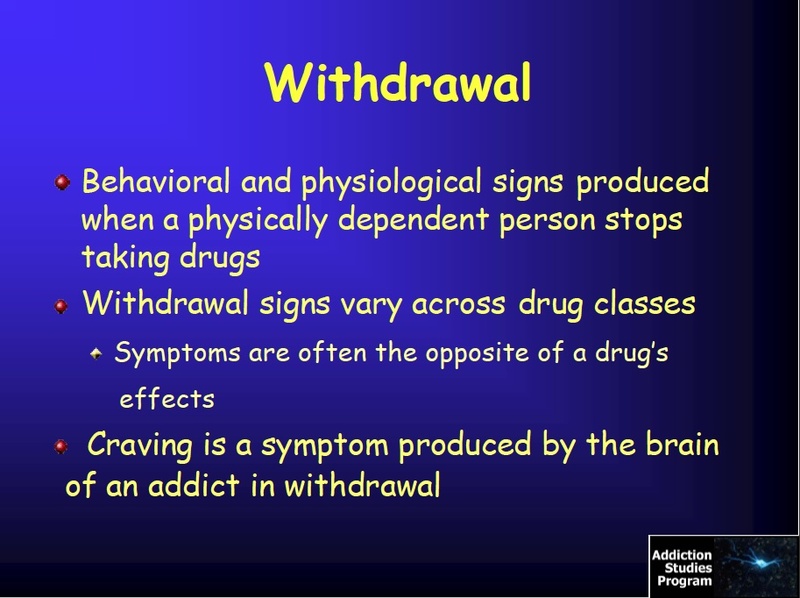 The symptoms and intensity of drug withdrawal can vary from horrifying to essentially non-existent. 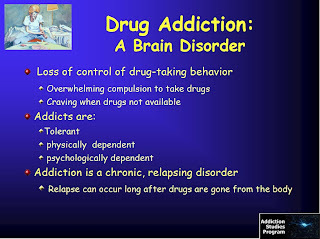 It depends upon the drug, the drug taker’s metabolism, the social setting, environment and expectations of the users, etc. 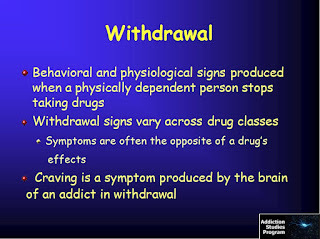 Craving and withdrawal represent the basic mechanism responsible for relapse. 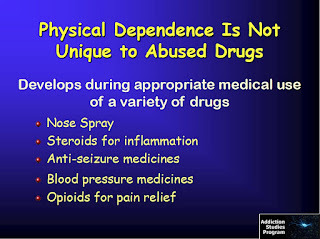 Most people are familiar with the “rebound effect” sometimes produced by over-the-counter nose sprays. Whey you inhale these medications regularly enough, the result of going turkey is… a profoundly stuffed-up nose. In an effort to expand on the “chronic disease of the brain” label affixed by former NIDA director Alan Leshner, Dr.Friedman directs our attention toward specific brain mechanisms: reward, motivation, and memory. 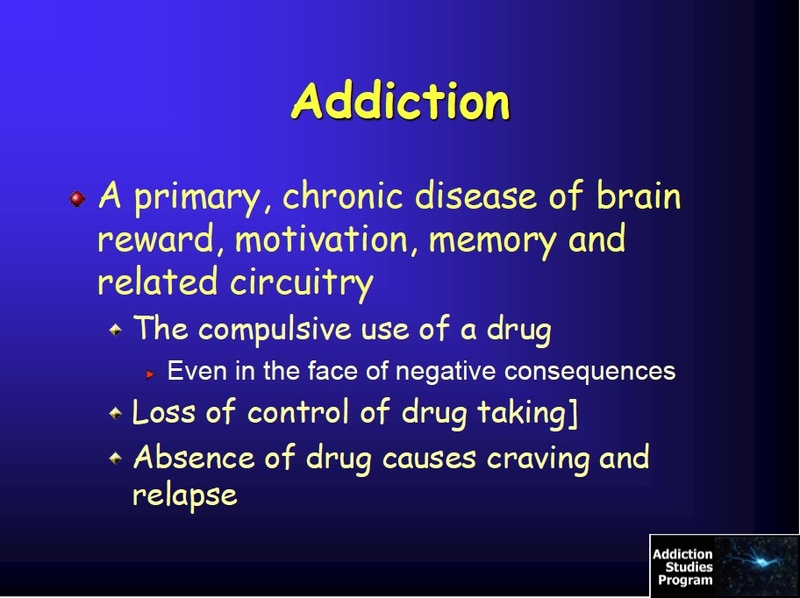 Addiction is a pediatric disorder, Friedman emphasizes. 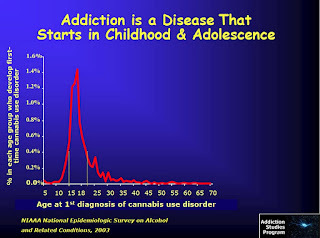 This is particularly true with marijuana abuse and addiction. Lke sugar in your blood, you can choose to control the amount of drugs you take, but you cannot choose your reaction to them. 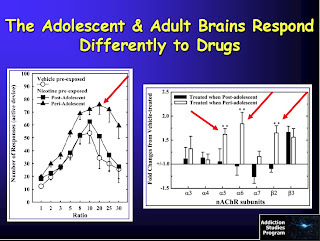 We know for certain these days that adolescent brains are not yet fully formed, and that adolescent brains react to drugs differently than adult brains. 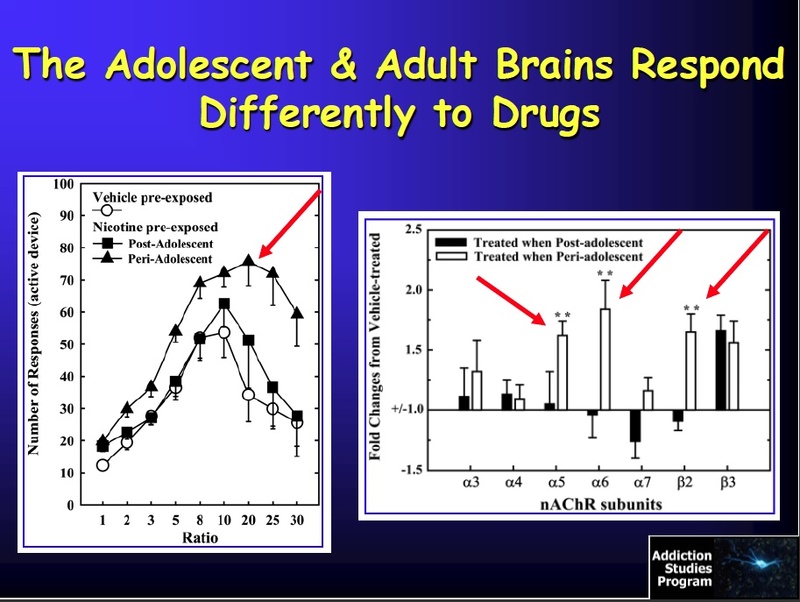 For example, recent studies show that the actual composition of adult nicotine receptors in the brain is affected by exposure to nicotine in adolescence. The net result of all this? 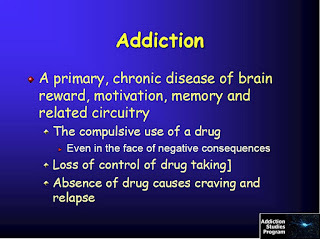 Things happen at the biochemical level that change how things play out at the behavioral level. Funny how in the first slide he states drug abuse is volunteray and in one of the subsequent slides first time cannabis use is referred to as a disorder..
You read it wrong. 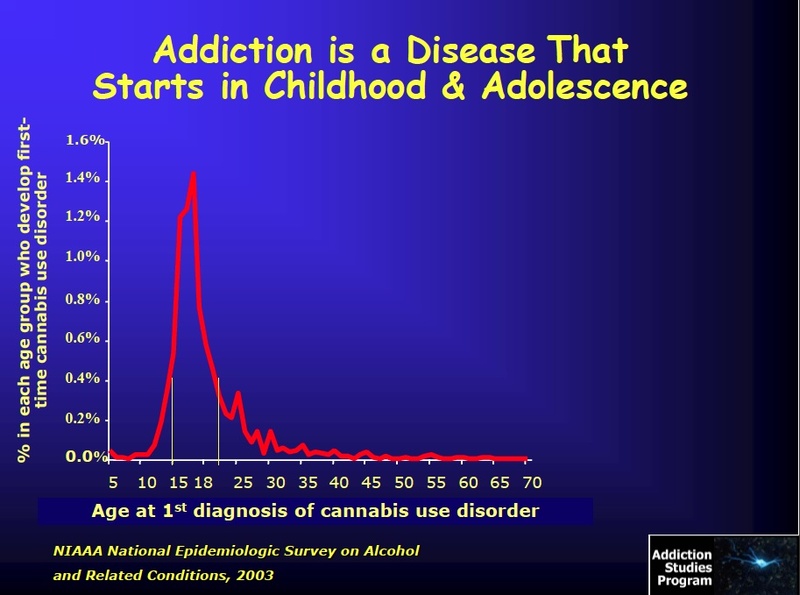 In the subsequent slide, he refers to "1st diagnosis of cannabis use disorder," not 1st time cannabis use as a disorder. 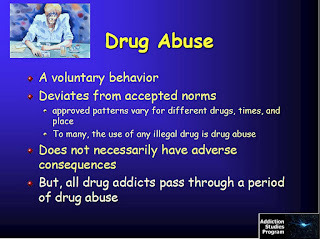 This is an excellent summary of abuse versus addiction. 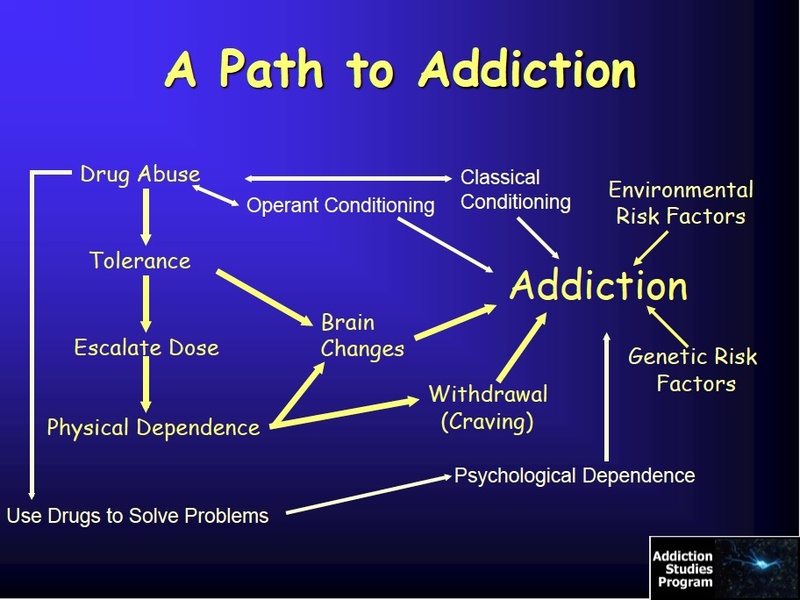 One think I would add is that 12 Step programs can have a positive impact on the brian and actually chenage the brian to moderate the craving and withdrawal effects of a drug.